Truckie Johnny almost lived every truckies worst nightmare when he was driving at night after Melbourne Cup. Out of no where a girl appeared on the road, it was lucky he was able to see her in time. This is one of the reasons he has a video camera mounted to his dash, to make sure he can record events so police know when he is not at fault. 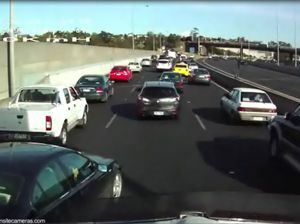 News IN WHAT could be described as a truckie's worst nightmare, a driver named Johnny nearly ran over a woman passed out on the side of the road after Melbourne Cup.